Chloe Silver Design: Chaaange Plllaces! Logos are crazy little things, but they're very powerful. Even when we don't realize it. When I say Golden Arches, what comes to your mind? Mmmm, time for a cheeseburger, I think. They're these tiny little designs that look like they took no time at all to create, but really they are some of the most carefully planned pieces of design. For example, did you know that the reason why McDonalds chose red and yellow for their brand was because those are the two colours that make us the hungriest? Don't paint your bedroom red or you'll be waking up for a lot of midnight snacks. One of my favourite logos is the new Baskin Robbins logo. The company has been around since 1945 and both namesakes were actually real people, but this logo was created in 2006, when the company changed corporate hands. Half of the B of Baskin and half of the R of Robbin come together to create a logo within the logo: the fact that they have always served 31 flavours. I also like the word "flavourite". Too bad it isn't catching on in everyday speech. "Hey, Jimmy! I bought some Ketchup chips for your party!" "How considerate of you, they're my flavourite!" 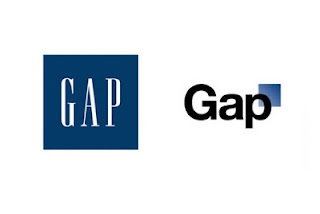 There was quite a kerfuffle over the change to the Gap's iconic logo in late 2010. 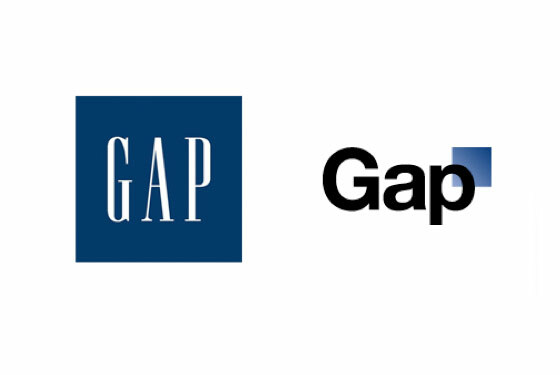 The old logo was reinstated only a week after the new one was introduced, and the new Gap logo was never to be seen again (except in disgruntled blogs all over the internet). Note: I enjoy the use of Helvetica in their new logo, attempting to be hip to the American Apparel crowd I would assume. iTunes also changed its logo recently in its 10th interface update, which I assume only scared some users of the program because there are always bugs popping up in any major changes to the program. It is for this same reason that I wait a long time to download new iTunes interfaces. Yes, I am one of those iTunes OCD-ers who needs to have every single piece of album art and album title correct, and I change all of the un-capitalized words to capitals too. Don't judge me, I just don't want three years of work to be deleted by a bug in a "fixed" program. 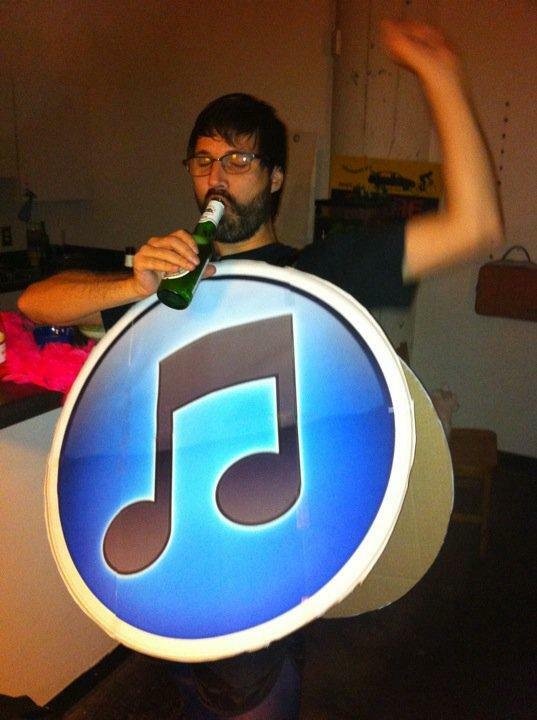 Via Hipster Runoff's costume contest of 2010, one dude sure does love his new iTunes logo. Good on ya, man. Rock on. It kind of seems like logos these days are taking a turn for the simpler, versus say, 5-10 years ago, when everything was shiny and bubbly (like the old iTunes logo and to a lesser extent, the new one as well). For example, I clicked the Google Chrome Quick Links icon to open a new internet page, and I thought that my little icon looked a bit different. After some googling, I found that the logo had indeed been changed without my knowledge! Yes, blown up, of course there is a difference, but when they're really small, I cannot be held liable for not noticing a small change (the colours are still basically the same). This is what I mean by shiny and bubbly (case one) becoming simplistic and colour-blocked (case two). I really like both logos, and I definitely like them better than both the Internet Explorer and Firefox icons. Have you noticed, though, that all three contain a blue sphere being encircled by an ethereal...thing? Seems like the Earth has a lot of internet-related energy floating around it, which, if you think about it, is kind of true! Funny how they're all very similar though. And so we end with this, a piece of nostalgia for you. I give you, the birth of the Google Chrome logo of old. Dude this is awesome! Makes me wanna grab 4 random things in my room and make a logo. lol. i like chrome and firefox.. haha! rofl on the last picture. Should also include Belk. Well there are logos, icons and corporative images. You want to give the consumer an image wich is easy to remember and easy to identify. Baskin Robins just modernized theirs, is the same name with the same 31 in the middle with the same colors. What GAP did was a corporative suicide, completly reinventing the central axis of your image is dumb, you will never see Coca Cola changing theirs even when its a bit complicated itself.